Remember when Duck fans were clamoring at the idea of their Heisman winner Marcus Mariota playing for Chip Kelly and his up-tempo offense in Philadelphia? Well, there’s no question that the Eagles would be fun to watch if Kelly and Mariota were somehow reunited in the NFL; however, that seems more like a pipe dream now. Kelly shocked the NFL world on Tuesday when he traded for Sam Bradford, who is a former Heisman winner in his own right, by giving up Nick Foles and a second round draft pick. Now, before we overreact, Kelly is a lot smarter than people think. Could this move possibly set up another transaction that will ultimately give the Eagles an opportunity to land Mariota? Possibly, but nothing is certain right now. According to ESPN NFL insider John Clayton, he believes that Mariota is no longer an option for Kelly and the Philadelphia Eagles. 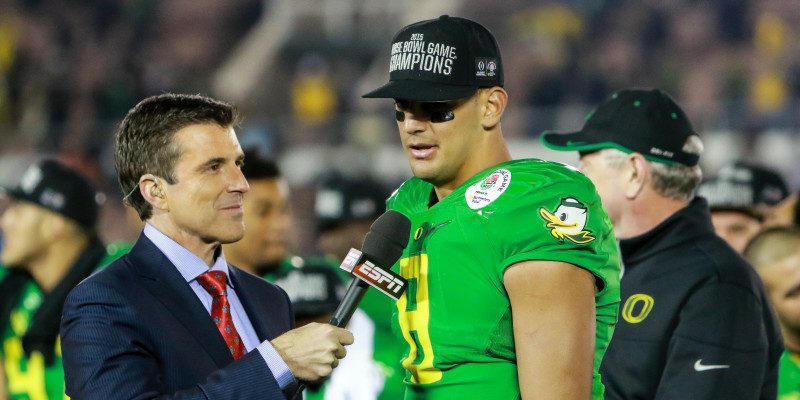 The long time NFL insider reported that it’s highly unlikely for Mariota to fall out of the top five in the upcoming NFL Draft. Clayton mentioned that there’s a new team on the horizon that will look to draft Oregon’s Heisman. There’s absolutely no telling where the Ducks’ prized quarterback will land on Thursday, April 30. Will Kelly somehow bring him to Philadelphia? Or will the Redskins step in and select him with the fifth overall pick?